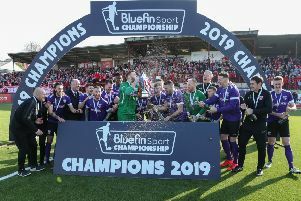 Over the 38 years and more I have written about the many happenings at Inver Park, I could count on the fingers of less than half a hand, the number of times a Larne manager has done what Davy McAlinden did at the weekend. And that’s why I am convinced the likeable ex-Cliftonville player has the potential to be not only one of the top Larne bosses of all time, but one of local football’s best. The reason I say this is McAlinden selflessly and candidly held his hands up and openly accepted that he was to blame for the team’s quarter-final exit from the Steel and Sons Cup exit at the hands of Amateur League club Albert Foundry. Having warned last week that Saturday’s path to securing a second semi-final spot in the space of four days was not going to be easily negotiated, McAlinden could easily have written it off as a bad day at the office or found any one of a dozen reasons why they didn’t win. But that’s not his style; instead he volunteered the truth - something I believe not many managers would have done in the same circumstances. “There’s no doubt in my mind we should have been going into the hat instead of Albert Foundry, being the senior team and having taken a 1-0 lead,” explained the Inver boss. “I was probably guilty of thinking we were not playing well enough. I wanted us to play better and so I decided to change our shape and that proved to be to the detriment of the team and we finished up losing 3-1. “I had originally toyed with the idea of making personnel changes for the match but I changed my mind. James McCabe, carrying a knock from the Tuesday game, was out and in came Scottie Irvine, which in no way weakened us. “But five or 10 minutes into the second half I tried to spark a better performance and that changed to situation and, in the end, it cost us a last four place. I was trying to produce a better display and I was at fault for the defeat, it’s as simple as that. “Reflecting on October as a whole, I got the great month I wanted with four league wins and a place in the semi-finals of the Co. Antrim Shield. So I am very happy with our lot, but I’m also very disappointed we aren’t still in the Steel Cup, a very important competition. “The victory over Ards last Tuesday was great, a tough match in which we had to show character, determination and ability and all we wanted in the draw was a home game and we got that against Ballymena next month. “But the focus now is on another match against Ards, when they come down to Inver on Saturday in the league. It’s another massive match and a huge test, but we can maintain our league momentum,” stressed the manager, as honest as ever in his assessment.